Back in 1994 Keystone Mascots owner Erin had the great opportunity to work the world's largest sporting event - the World Cup. It was an exciting time for soccer fans in America, and getting to help bring life to Striker, the World Cup Pup, was a unique opportunity that only a few volunteers can boast. Through a kind-hearted friend Striker came to dwell in Erin's brood of mascot characters and every once in a while he peeked his head out to promote soccer fun in Pennsylvania. In the summer of 2014, however, Striker got THE CALL. He answered that call and made his way to San Jose, California - where America's denim-clad team stunned the Brazilian favorites in a World Cup match twenty years before. 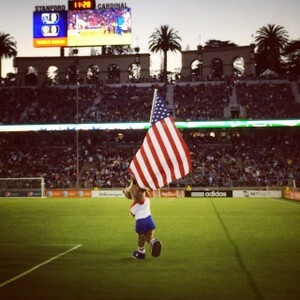 Carrying the US flag, Striker made sure that fans will remember how important it is to "believe that we will win". If you would like more information on the soccer doggie feel free to contact us.